Join Louis and Me the ~Z~ as we discuss the 1982 film about 2017, Blade Runner! We have a blast yappin’ and laffin’ and livin’ and grinin’. Enjoy!! Five lucky people will win a PSB Music Collection CD from me the ~Z~ and Ferguson from Zerbinator Land‘s “Please Stand By” podcast! The cd will have 8 tracks in all and will be completely free to those 5 winners. 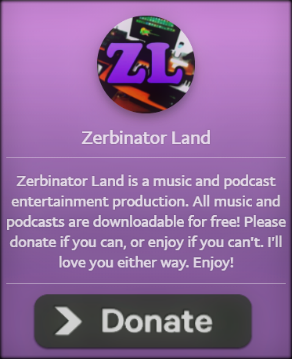 All you need to do is call 571-408-ZERB (9372), or email to instrumentally@gmail.com, and say these three words… “I Love Music!” That’s all, and the music is yours! We will announce our winners on our “3rd Annual Belated Thanksgiving” episode! Enjoy! Mr. Louis and me the ~Z~ discuss one of our favorite movies of all time, “Young Frankenstein” from 1974. Have a listen as we speak of the movie, it’s actors, it’s director, and a lil history thrown in as well. Enjoy!